When is the right time to send email campaigns? Email remains one of the most, if not the most, cost effective means of marketing. Assuming you've got your data from people who've signed up to hear from you rather than buying a list of course, you're talking to people who have said they like you, your brand and your products. Sending email newsletters is straight forward enough. Free options from MailChimp are a good way to start although, a word of caution, they don't appear to be mobile responsive when using the free version. Increasingly, your customers will read their emails on their smartphone. A rather surprisingly statistic not long ago put 84% of people checking their phone before they even got out of bed in the morning! If your email can't be read on their mobile, you're increasing your chance that they'll just bin the newsletter without even reading it. Time is money and is pressured. We're in a responsive and reactive world so sending your campaigns at the right time of day and ensuring its mobile friendly is vital. Major brands, even locally in Cumbria, are using non-mobile friendly newsletters and loosing potential customers and impact. Make sure you're ready for mobile on your website and email newsletter systems. 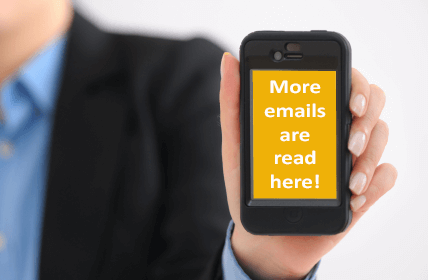 If your newsletter can't be read on a mobile, it'll more likely be binned within seconds. Working out the right time to send a campaign is never an exact science. Studies are done and continue to be done. My point above about people reading before they get out of bed could suggest first thing in the morning could be a good time to send...right? Possibly! If you're in the accommodation world, Tuesday is suggested as the key day as people start looking for the weekend ahead. If you run a visitor attraction or put on an event though, when is the right time? As individual as we all seem to be, there are character traits and associations we all have linked to the weather. A recent programme showed one high-street chain advertising online their swimming costumes when the sun shines in a region, regardless of the time of year, and it picked up sales of something like 600%! For visitor attractions, events and even accommodation providers, from the years of building and advising local, national and international brands that I've worked with, a few key factors have come out. Looking at these two points, how can you use them to your advantage? Using our fully branded email newsletter system, you can schedule campaigns to go out at the right time. As your list of customers are unique to your business, you can only test and respond to how your customers react to your campaigns. That means looking at the reports on opens and clicks, trying A/B testing (sending 2 versions of your campaign out to see which gets the best response) and slowly tweaking your campaigns. I would urge you however, to think and plan ahead. When the sun is shinning, ticket sales go up. The 'feel good factor', the ability to imagine relaxing or enjoying what you're offering has a huge impact on how your customers respond. So, as you're enjoying the sun, so are your customers. Make the most of the nice weather and respond to it by reminding your customers you're there and what a great day out or weekend break you can offer and see how they react. Use a mobile responsive email newsletter to get the best impact and utilise the A/B testing options. Monitor the results and tweak your timing and messages to ensure you get the maximum impact from your campaigns. Don't forget the sun though and use it to your advantage!